A few miles inland from Troon and on the edge of the village of Dundonald lies a 100ft high mound crowned by Dundonald Castle. The mound looks artificial, but the crags on its west side, ideally placed to catch the unwary photographer trying to frame the castle, suggest nature had a part to play. There is nothing subtle about Dundonald Castle. The structure whose remains are on view today can be traced back to the accession of Robert II to the Scottish throne in 1371. This was his favourite home and he died here in 1390. But while this may have been Robert II's favourite home, it is difficult to think of it as in any way homely. After a visit in 1773, Dr Johnson wrote: "Though of considerable size, we could not, by any power of imagination, figure it as having been suitable habitation for majesty". The massive tower house which dominates the castle, the village, and the countryside for miles around, is a brutal hunk of grey stonework. And this lack of human scale becomes all the more obvious from the inside. The entire tower house comprises just two rooms, with a basement level below. The main room is the remarkably preserved Laigh Hall, or Lower Hall. This impressive vaulted room was where the public business of the King would have been conducted. 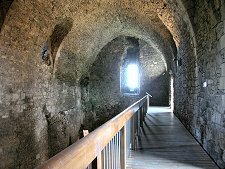 As restored there is a walkway at a higher level within the hall at what would have been the original floor level. 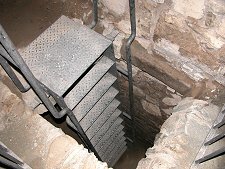 Below this would have been storage cellars. Beyond the high level walkway is access to the annex which was added to provide additional space. 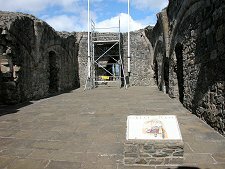 This includes a prison with a pit below it, while upper floors would have provided more comfortable accommodation for King Robert and his family. The second main room in this one-up-one-down castle is reached via a modern spiral stairway that takes you up to the Great Hall. This has long been open to the sky and the elements, but as originally constructed would have had a decorative vaulted roof, probably with defensive walkways above it. 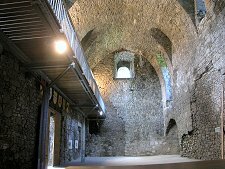 The Great Hall came complete with small private spaces at either end and access was then added to the now ruined upper levels of the later annex. The west face of the tower house retains evidence of the real people who once lived, loved, and died here. 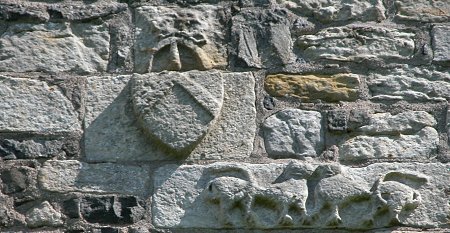 Some of the earliest stone heraldry visible anywhere in Scotland can be seen in the form of a line of five shields carved at high level on the wall. 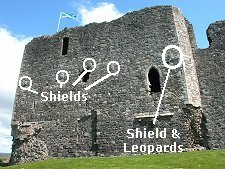 And below the right-hand shield is what has become the symbol of the castle, a carving of two leopards. The location of these carvings is shown in the image below right and the leopards are shown below. 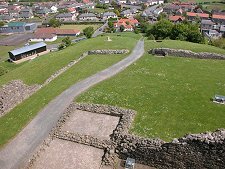 Recent archeological excavations show that the castle whose remains are on view today was just the latest in a long line of forts on top of this hill. 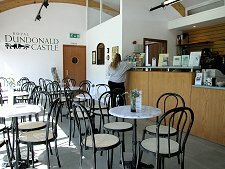 The excellent visitor centre and cafe run by the Friends of Dundonald Castle has a series of models showing stages in the castle's development. The first fort here was probably constructed in the stone age, but by AD500 a defended settlement occupied the top of the hill. Not well-enough defended, apparently, because whatever was here burned down in about 1000, and the fire was so fierce it melted or vitrified the surrounding rocks. In 1200 a classic motte and bailey castle stood here, which by 1300 had been replaced by a grand stone castle rather larger in scale and ambition than its later replacement. It's pointless to suggest that Dundonald might have been a more complex set of ruins if the 1300 castle had survived: the wars with England in the early 1300s left it badly damaged and the gatehouse was then used as the basis for the tower house of Robert II's castle. 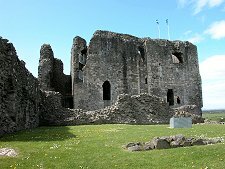 Dundonald Castle went out of favour as a Royal residence in the early 1500s and when sold to Sir William Cochrane in 1636 it was already in a state of decay. 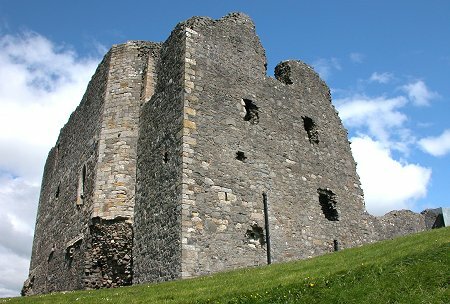 Ten years later he used the castle as a quarry in the remodelling of nearby Auchans Castle, itself now also a ruin.